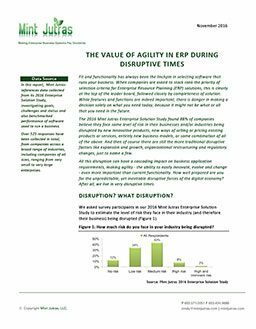 Find out how an agile ERP system can help you thrive during turbulent times in this free report. If your industry hasn’t been disrupted by new products, services, technologies, and business models, it probably will be soon. No ERP system can completely protect your business from the threat of losing market share in this uncertain environment. But using an outdated ERP system can certainly limit your options. It’s critical to choose an ERP system that not only meets your current needs, but also maximizes your agility for the years to come. Learn how in a new report from Mint Jutras. How outdated ERP systems can hinder your ability to exploit new opportunities. Why you no longer have to fear the ERP customization process. How to add new functionality to your ERP in a way that’s easy to consume. Why SaaS is now the leading deployment option among survey respondents. Three surefire signs you need a new ERP system. In the 2016 Mint Jutras Enterprise Solution Study, 88% of respondents said they believe their businesses face the risk of disruption. Prepare for the changes ahead by finding the right ERP system. Get free Mint Jutras report! Talk to any Acumatica customer and very quickly you hear the word “open.” That’s most often cited as a primary reason the company chose Acumatica’s Enterprise Resource Planning (ERP) over other solutions.